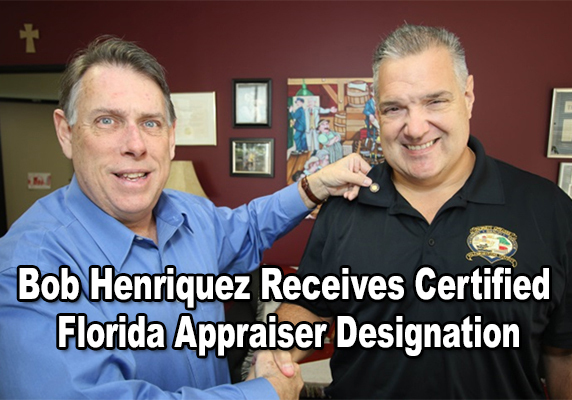 TAMPA -- In less than three years on the job, Hillsborough County Property Appraiser Bob Henriquez has earned his Certified Florida Appraiser (CFA) designation. Henriquez, who took the reins of the HCPA in January, 2013, received the title after meeting all standards established by the International Association of Assessing Officers (IAAO). This included the completion of core studies in appraisal theory, as well as completing two years of work in a mass property appraiser’s office in the state of Florida. Henriquez's CFA designation comes on the heels of his office receiving the IAAO’s prestigious Certificate of Excellence in Assessment Administration (CEAA) award, an honor fewer than 30 jurisdictions in the nation have earned. "I believe I came into this office with the proper skill set and work experience to administer a large staff, but throughout the election I promised the people of Hillsborough County I would expand my technical knowledge in mass appraisal," Henriquez said. "This CFA designation is a big first step and I’m totally committed to continue that learning process each and every day to make this the very best property appraiser’s office in the country." While Henriquez says the CFA designation was an important goal to reach, he believes his experience in successfully guiding the HCPA to reach its strategic goals and simultaneously administering nearly 130 full-time positions has been even more vital to the citizens of Hillsborough County. Since taking office, Henriquez has implemented more cost-efficient, state-of-the-art appraisal methods, including the use of a fleet of gas-electric hybrid vehicles and instituting a desktop appraisal software that recently won a Digital Government Achievement Award. This software was recognized for its improved fairness and accuracy in property assessments while adding thousands of dollars in revenue for local taxing authorities. Other property appraiser offices have already followed Henriquez’s lead, with Sarasota County recently signing up for the HCPA’s desktop appraisal software and Orange County introducing its own fleet of hybrid vehicles. Earlier this month, Duval County Property Appraiser Jerry Holland and his senior staff visited the HCPA to study its desktop appraisal software, strategic plan and daily workflow procedures. Henriquez, a Princeton University graduate and fifth-generation resident of Tampa, says he gained valuable leadership experience for the HCPA in both the private and public sectors. In the private sector, he has worked as a consultant for engineering and planning firms and was a government affairs coordinator for the Tampa Bay Builders Association. On the public side, Henriquez served four terms as a State Representative in the Florida Legislature and, later, led a staff of several hundred as the head of the Pinellas and Pasco counties division of the Department of Children and Families. In addition, Henriquez worked for Hillsborough County’s Streets & Addresses department to help enhance its 9-1-1 program and worked for the county’s Planning Commission to assist in growth management. Henriquez has also learned teamwork essentials as a former football player at Princeton and Tampa Catholic, as well as serving as the Crusaders’ head football coach for 17 seasons. During his second stint as TC’s head football coach, Henriquez led the team to two appearances in the state championship game. Henriquez worked another five years as an assistant football coach at Jefferson High School and Tampa Catholic. Going forward, Henriquez says he plans to continue to improve his technical knowledge in mass appraisal while fine-tuning the HCPA’s office operations and efficiencies. The primary goal, he says, is fair and equitable appraisal and the best possible service to the people of Hillsborough County. “I want to continue the learning process and we as an office want to be the standard by which other appraisal offices measure themselves," Henriquez said. “The aim of all this, of course, is to humbly and honestly serve the people we work for – the taxpayers of this county."